The other morning I woke up to over 100 emails in my inbox. For me this means they landed on my tablet and on my laptop. A blogger sent an email about her payment discrepancy to a group email instead of the accounts department. Firstly, I would love to be earning that kind of money and secondly, why did everyone have to hit the reply to all button? I was about to block the subject as being spam but soon realized that it was just the same email, over and over again, with a whole lot of people replying unsubscribe or listing their blogs. I popped on over to a few of the food blogs to say ‘hi’ and I sent an email back to the sender about her obvious mistake. What was even funnier was that some people hit reply all to tell everyone not to reply to all! I am sure we all worked that part out. This stir fry is one of those dishes that will work out as it is so simple and so versatile. You don’t need to use the paneer and if you want to you can use tofu. Change the chicken for beef, or keep it vegetarian and add more of the paneer. Which ever way you look at it, this chicken and paneer stir fry is worth making. I made my own spice blend for this recipe, as part of the Daring Cooks challenge. The Kadhai Sauce is a wet spice blend, essential to this dish. This stir fry makes use of kadhai sauce, which is extremely tasty. Oh how frustrating, funny how people are so intolerant of a mistake tho huh?! Love your recipe, simple and oh so tasty. Can you believe I have never cooked with paneer yet. I so need to sort that to and this recipe looks like a good one to start out with. Yummy recipe. Did you make the paneer Tandy? Such a lovely colourful dish – Tandy – and sounds fabulous. Oh no! The dreaded “reply all”!!! We had a very similar situation at work – things went out of hand too quickly! 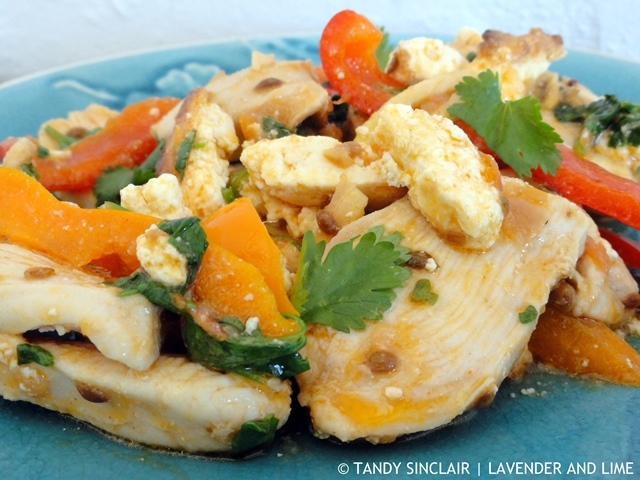 Tandy – this chicken and paneer stir fry could put out a lot of fires though! I could just dig in and forget about everything else! Looks scrumptious! I’d die to taste it! I couldn’t help but lick my lips when seeing this dish. I so need to eat lunch lol. Great post. Oh, I love the paneer in this dish! Always nice have a easy and versatile recipe. Love the flavours in this Tandy! Typical Indian treatment of paneer can be quite heavy on spice or cream but this is so light and fresh!